We are looking for students with video and editing skills to help document events, activities, workshops and projects that take place in Bristol’s Parks, Green Spaces and Neighbourhoods throughout the course of Bristol Green Capital Year 2015. 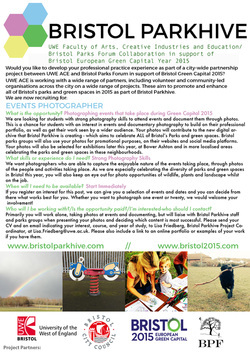 The raw footage would then be edited into a series of short promotional videos hosted on our Parkhive YouTube channel, and which could then be used by Bristol Parks Groups to promote the work that they do on voluntary groups’ websites & social media, as well as potentially included in a range of exhibitions that will be run in Neighbourhoods across the city celebrating those places (e.g. an exhibition of films of Bristol Parks at Knowle West Media Centre). Additionally, your videos will be used to support funding applications by Community Parks Groups volunteers, and to demonstrate the importance of Parks and Green Spaces in the city to a wide range of stakeholders & audiences (including local people, politicians, funders etc). This project also has scope for you to create videos of your own content, by choosing a topic or issue around nature/parks & greenspaces that interests you, and making a short film or video that is creative or documentary/journalistic in nature. This is a great chance to have your work seen by a wide and varied range of audiences. It’s also a good opportunity to develop your own professional portfolio, and gain some great experience in documentary and events filmmaking. There are many events taking place throughout this year. If you’d like to help film just one of them in the park nearest to your house, or twenty of them in areas across the city, we’d love to hear from you!